I confess, this is kind of a misleading title. My therapy cat visit wasn’t a marathon. But it was the day of the L.A. Marathon, with lots of closed roads blocking our path to the hospital we were scheduled to visit. 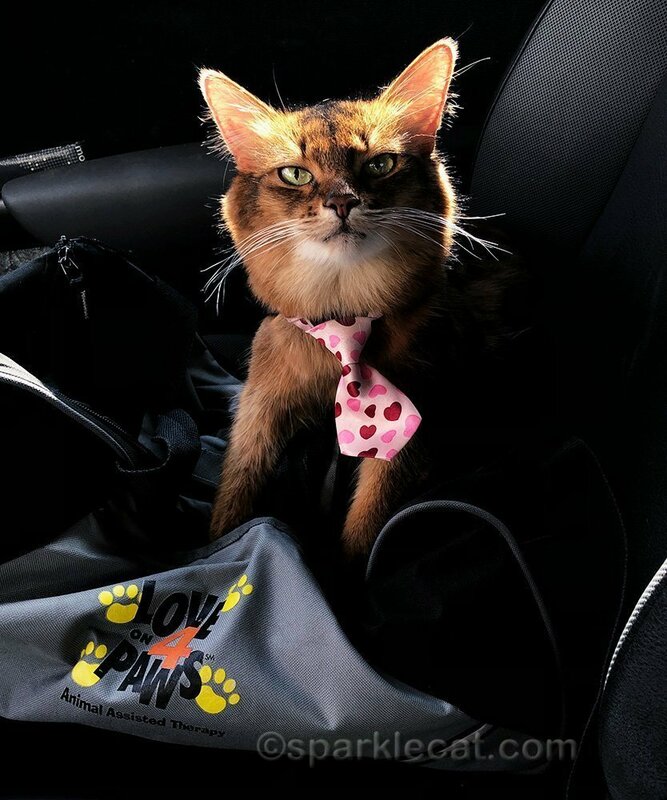 My human usually avoids doing therapy cat visits on L.A. Marathon day, but this time around, she really wanted to get us down to this particular hospital. It turned out that the phone’s map app took good care of us, and the route it had got us to the hospital with plenty of time to spare. The morning got off to a slow start, since the first few patients didn’t want visits. But then my human reluctantly entered the room of a patient who seemed preoccupied — and when she saw me, her face lit up! Patients who really want to see me get this special smile that my human has learned to recognize. We spent a lot of time with her. I laid down next to her and purred and made happy paws. At first, I laid next to her lower abdomen and not her chest like she wanted. My human explained that sometimes I liked to be next to the part of the patient that needed healing most. Then she picked me up and told me, “Her heart needs healing too!” I got it, and laid down under the patient’s arm and made happy paws there instead. Another patient we saw had her family visiting. Although it was well covered up, the patient had an open wound in her chest, but she really wanted me on the bed with her. So my human put the sheet down next to the patient, and made sure I stayed next to her and didn’t move from my spot. That was a nice visit, and a couple of the family members wanted to pet me too. One man said that cats did not like him, but my human said I was nice and wouldn’t hurt him, so he petted me too. The next man had a long row of stitches going down his abdomen, so once again my human made sure I didn’t get too close to his wound. He had some tattoos, and one was of a cat wearing an eye patch. He explained that was a cat he had. The cat had been a stray he was feeding, and then one day, the cat disappeared. When he showed up a few days later, his eye had suffered a horrible injury. The man took the cat to the vet, but couldn’t afford to pay for his surgery — he wasn’t even his cat. But the vet made a deal — he said that if the man promised to adopt the cat and take care of him, they would do the surgery for free. And the man wound up having the cat for 13 more years! The last man we saw was sitting up on the bed and was so happy to see me. I laid down on the bed while me petted me. “I got here on Tuesday,” he told us, “and it doesn’t look like I’ll be getting out anytime soon.” He had been feeling a little down about that, he said, and my visit really brightened his day. I was so glad that my human didn’t let the L.A. Marathon get in the way of my visiting today! There were obviously patients who needed me here. Oh boy! If the traffic for that is anything like the New York Marathon, that was a lot of traffic and road closures! It’s so great that the patients loved seeing you so much. We have the advantage of freeways cutting through the city, which made it easy to bypass the closures. What a great visit for all! I’m so glad that you made so many people happy with your visit. Healing paws to heal hearts & hurts. You are so good a helping people heal. Hearts, body, mind. You help mend everybodies’ heart. They sure did need your love and attention, Summer. You ought to write a post about why some patients don’t want to see you. I canNOT imagine why they wouldn’t, but … maybe a subject suggestion? Bet they are in the minority though. If you visited MK in hospital, she’d lick the door and not let you out! MOL! Summer, I am very very proud of you and how well you do and enjoy your visits. And I am very very proud of your human too for all her work, patience and more work to help you become the great therapy cat you are. Lots of love to you. “Her heart needs healing too!” That’s so beautiful! And bless that man who saved the kitty and then had her for 13 wonderful years. Well done Summer. You make a big difference to people when they need it most. Without you and your human these people would not have as much warmth and love while in hospital. I love that story of the man with the tattoo of a cat with one eye. Sounds like you spread a lot of joy- as always. I admire your human for driving on marathon day, I admire her anyway, but that is above and beyond. You do such important work Summer, we’re all so proud of you! Never thought about marathon as a spot for therapy kitteh, but makes sense. Thank you sweet. Oh gosh, the 1st post brought tears to mom’s eyes. She was just so touched. You and your mom do tremendous work with people. You girls are special and loved by many. We all admire you. We are so happy to hear about your visits. Just goes to show that love, goodwill and happiness is still very much alive in this crazy world. Peace, love, happiness and Purrs. Summer, those patients were so glad to see you; must make you feel terrific! Well done, Summer (and your human, too). It’s a wonderful thing you do, Summer. I would love to see you. glad to hear it wasn’t a marathon workload… though it sounds like there are plenty of patients who you are bringing joy to. Love reading about your therapy visits! It sounds like you took a big bunch of happy with you sweet Summer! Oh Summer, you and your human are so dedicated to those needing the special and loving therapy you give them. Good job Summer cheering up those people and making sure you didn’t get near their wounds. That was another good visit. I like the story about the man with the cat tattoo.